Stop Campus Carry – Concealed carry does not transform ordinary citizens into superheroes. Concealed carry does not transform ordinary citizens into superheroes. Your classmates might be armed. 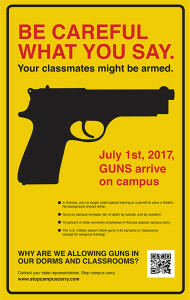 On July 1, 2017, GUNS arrive on campus. In Kansas, you no longer need special training or a permit to carry a firearm. No background checks either. Guns on campus increase risk of death by suicide, and by accident. The U.S. military doesn’t allow guns in its barracks or classrooms (except for weapons training). WHY ARE WE ALLOWING GUNS IN OUR DORMS & CLASSROOMS? Contact your state representatives. Stop campus carry. Click for a free downloadable poster (represented at right) featuring the above information! Get the facts about campus carry in Kansas! Further reading about campus carry, guns, and the law. What does campus carry mean? (pdf): trifold pamphlet to print & share. "A concealed-carry campus becomes a campus in which everyone carries a potential gun. 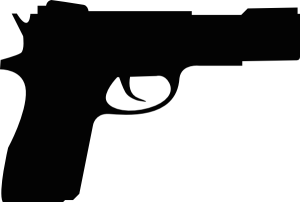 And the potential gun is far more powerful than the real gun, because it both issues and revokes a threat all at once." Copyright © 2019 Stop Campus Carry. Powered by WordPress. Theme: Spacious by ThemeGrill.